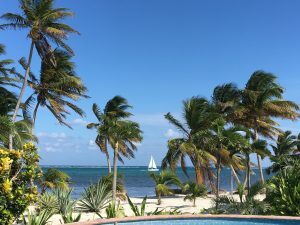 I am not a travel agent or blogger but my U.S. real estate expertise has enabled me to give a heads up to the potential Belize real estate investor. I am a California real estate broker with over 40 years of experience in selling, financing real estate and over 50 years of owning income producing real estate. In Belize (Ambergris Caye) I presently own a 4-unit commercial building and a Villa (Villa Descanso) that we use as a Vacation Rental. If you visit Belize and get the “bug” as I did, I definitely suggest Ambergris Caye or Caye Caulker rather than the mainland. Belize is a VERY poor country and, I suggest, purchasing property in tourist areas with a lot of tourists. Ambergris Caye is the largest island off the coast of Belize and my Belize experiences are centered there. Belize is VERY easy for the typical American/Canadian investor. Everything is EASY and you don’t have to learn a new language as it is English. You don’t have to convert currency as the U.S. dollar is just as accepted as the Belizean dollar. Even keeping track of the Belizean dollar is a cinch as it is a fixed rate of 2 Belizean Dollars to one U.S. Dollar. There’s a lot more. Electric “stuff”? No problem; just plug in using standard plugs. No need to use converters on the plugs. Telephones? same; regular phone jacks. What’s for sale? Everything you can imagine. If you’re looking for instant gratification you can purchase a vacation rental and use it often and, probably, break even or make some cash flow. For strictly cash flow; purchase a commercial building. For long term appreciation, purchase anything. Maybe some lots in the path of progress… BEWARE! As I discuss Real Estate Brokers, I will warn you about the dangers of them NOT being licensed and the path of progress that may be decades away rather than what is going to happen “soon”. I have many reasons to suggest that you not buy a single house as you will want the “safety in numbers” concept. The complex where Villa Descanso is consists of 6 Villas and we have a security guard during the overnight hours. That would not be affordable if you purchased a single house. Remember, Belize is a poor country. I do not have “a dog in this fight”. All I know is a fair amount about Ambergris Caye from my many trips and contacts. As far as I’m concerned, ANYTHING on the island will make you a good return, long term IF you buy right in the first place. The first thing that you are going to need is some island experience and the ability to find a good broker. PLEASE, PLEASE don’t go down on vacation, fall in love with Belize and purchase something on your first trip to Belize. Go down a few times and get your feet wet. I am chuckling as I write this as I did something that sounds CRAZY or, perhaps SUICIDAL. I purchased a commercial property sight unseen from the U.S. but I did have an advantage. Anybody who knows commercial property, knows that the figures make the deal. Sure; there is a lot more to it like knowing the rental market, the probability of increased future rents etc… I would not have even considered purchasing the Villa without a LOT of investigation but the Commercial property was easy for someone who has owned income producing property for over 50 years. And, yes, it was a “deal”. When I made that purchase several years ago, there was NO question that Ambergris Caye was, and is booming. You will need to find the right Real Estate Broker and that is the MOST important thing I can tell you. In the States we “assume” a certain amount of HONESTY because of the real estate license, broker supervision, and the threat of lawsuits. You can throw all of that away in Belize. The cab driver taking you from the airport can, legally, sell you real estate and charge commissions. Just imagine buying an ocean front lot, and finding out it was 8 lots back on the other side of the North road. Can he/she lose the license? he/she never had one. Can you threaten to sue the broker? They never had one of those either. Ok, you deal with someone in a small office downtown and buy the same oceanfront lot. Same result but, this time he/she didn’t do it purposely; they made a mistake. You’re still screwed. Well; you still can sue the agent. Forget about it (see “the ugly” below). There is a saying about the typical real estate salesperson. “they couldn’t make it in the states so they started all over down here”. It would NOT be a shock to find out that your agent or broker is a convicted felon in the states. Enough said… Here’s what you need… An ESTABLISHED broker who has had an office on the island for many years. Not a broker you met in a bar; one referred to you by a couple of people who have used him/her for several transactions. In the states, “knowledge of the market” is the most important: in Belize honesty and LEGAL knowledge are more important. Knowledge of the market is part of what you get with a broker who has practiced for many years… Legal expertise trumps market knowledge… Why? Remember my lot purchase example above? Well here is a shocker. MOST real estate transactions do NOT have TITLE INSURANCE. A good broker understands title and checks BEFORE you get hung up. Trust me; the taxi driver salesman has no clue. Title insurance IS available from the states but it takes forever and most sellers won’t wait for months. Most transfers are handled by attorneys on the island and the charge is, generally, two percent of the sales price. The buyer’s attorney DOES the title search to make sure of the SELLERS clean title and handles the transfer to you. Well; if the attorney makes a mistake; you have a problem. Will the attorney try to fix the problem? sure. BUT if it’s a major problem costing $50,00-200,000 to fix; good luck. There are also “management companies” that perform the same service and they, generally charge one percent. Did I purchase two properties anyway? Yes, as I had faith in the management company doing the work. No question; do not think this is the states. You will be at a big disadvantage if there are legal problems. Though attorneys are cheaper than the states, the court process is a mess. Once again BELIZE IS A VERY POOR COUNTRY! Graft is rampant in most third world countries. Foreigners are at a DISTINCT disadvantage when dealing with courts, police etc… I am aware of several break-ins by the same person about a year ago. He was caught on surveillance tape and arrested. Not even prosecuted. If the owner had really pushed the issue, there would have been a discussion about how many times during the proceedings the owner would be able to return to Belize for the trial and many delays. Do I feel a “gringo” is on equal footing in court with a Belizean; no way. Can judges be swayed with $$$ under the table? Belize is a very poor country! !